Spray grill with nonstick nonflammable cooking spray. Preheat grill to medium high heat (350 degree to 400 degree). In a large bowl, combine ground meats, 2 tablespoons mustard, garlic salt, and pepper. Divide mixture into 6 equal portions; shape each portion into a 5 inch patty. Grill patties, covered with grill lid, desired degree of doneness. Top each patty with one lice cheese. Grill buns, cut sides down, for 1 to 2 minutes or until toasted. In a large skillet, melt 1 tablespoon butter over medium heat. Divide ham into 6 equal portions. Shape each portion into a 5 inch wide stack. Add 3 stacks to pan, and cook for 3 to 4 minutes per side or until lightly browned. Repeat procedure with remaining 1 tablespoon butter and remaining 3 ham stacks. Set aside. In a small bowl, combine mayonnaise and remaining ½ cup mustard. Spread mayonnaise mixture over cut sides of buns. 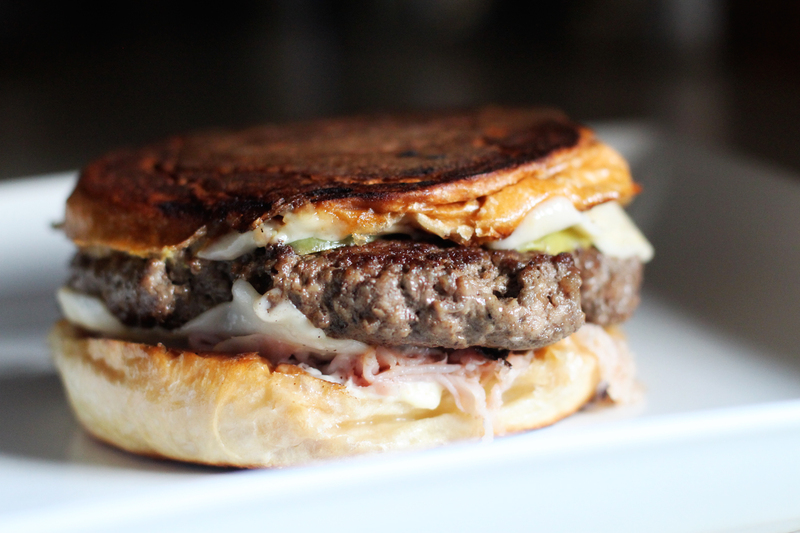 Top with pickles, patties, and ham stacks cover with bun tops. Serve immediately. End.